Did you know that Tucson is the location of the southernmost ski resort in the US? Yes, that Tucson — the Tucson famous for its 120F summer days (but it’s a dry heat). 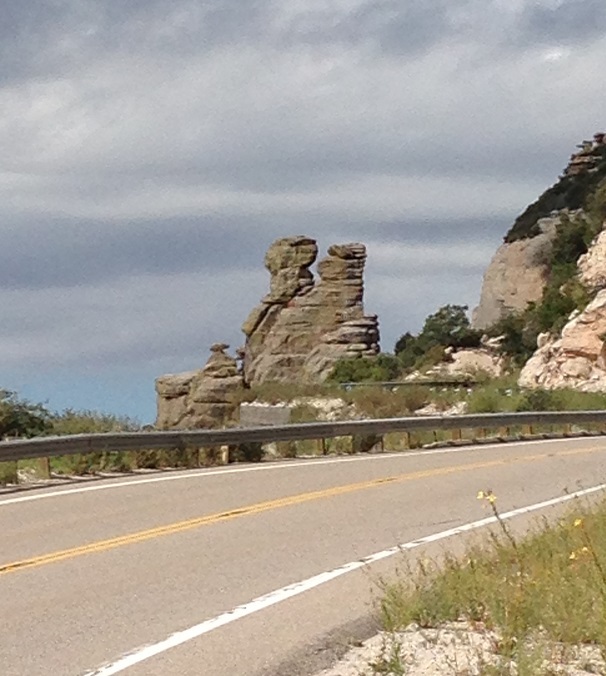 The Mount Lemmon Ski Resort is at the top of (you guessed it) Mount Lemmon (named for bontanist Sarah Plummer Lemmon who, in 1881, became one of the first non-natives to make it to the top). At 9,159 feet, it’s the highest peak in the Santa Catalinas, a mountain range that runs along the northern border of Tucson. 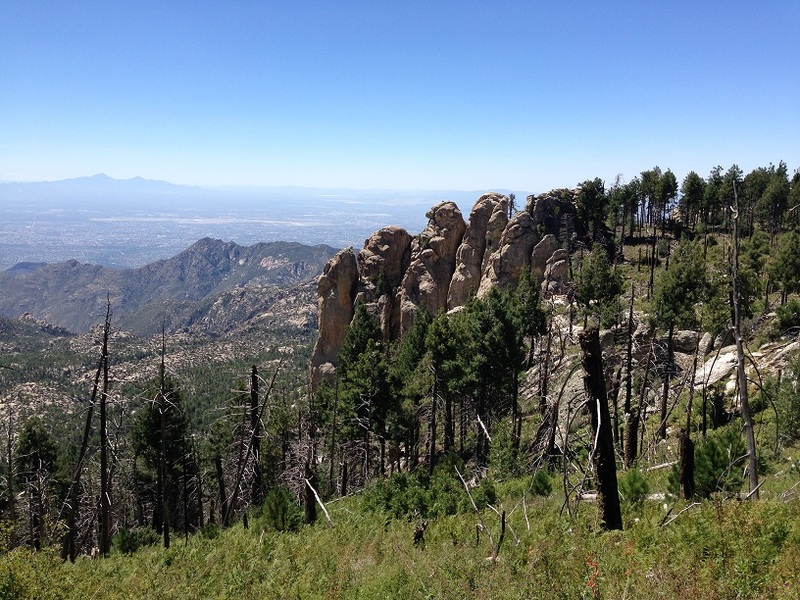 While the city is slow roasting below, the top of Mount Lemmon is generally about 30 degrees cooler. Between December and March, that makes it snow country. The rest of the year, it’s a great hiking area. 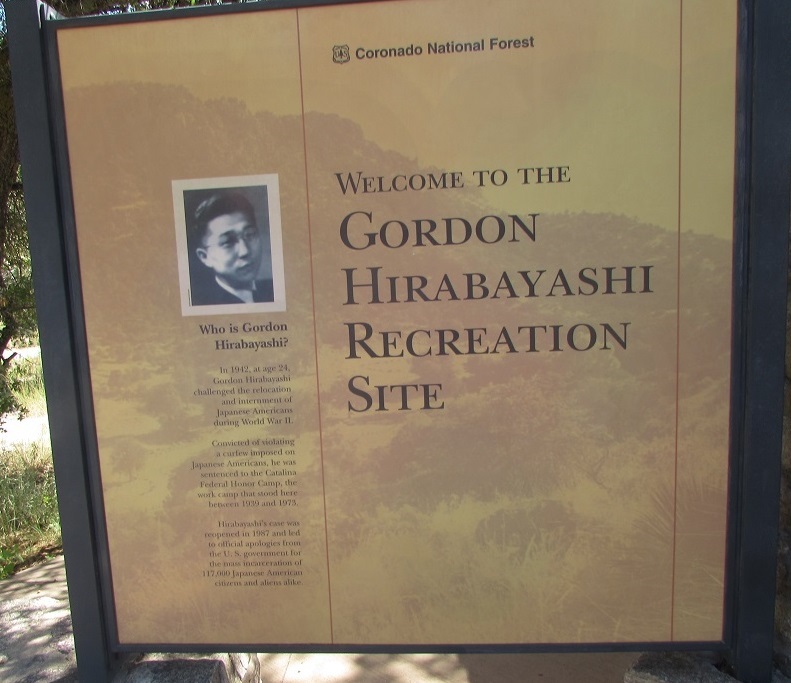 So we were making our way up Mount Lemmon one summer day when I noticed a sign for the Gordon Hirabayashi Recreational Site. 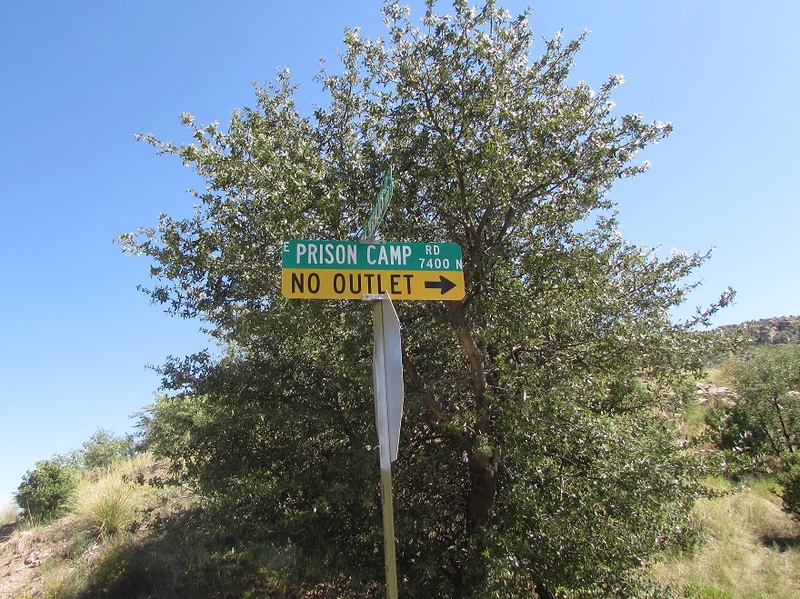 It was near mile marker 7, on Prison Camp Road. 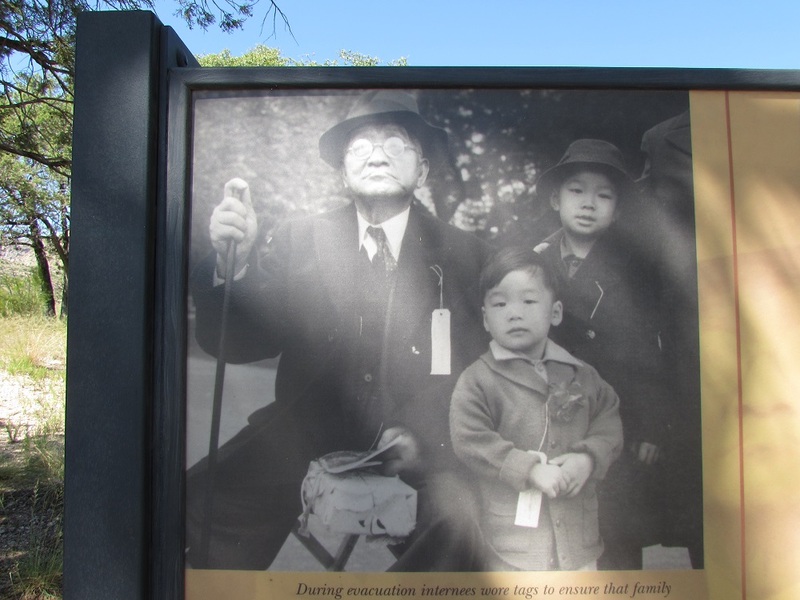 The first thought that a History Tourist has upon seeing an Anglo first name with a Japanese surname attached to a site on Prison Camp Road is of the internment of Americans of Japanese descent during World War II. There’d been an internment camp — the Gila River War Relocation Camp — north of Tucson, but I’d never head of one in Tucson. Turns out that there had been one, of sorts. 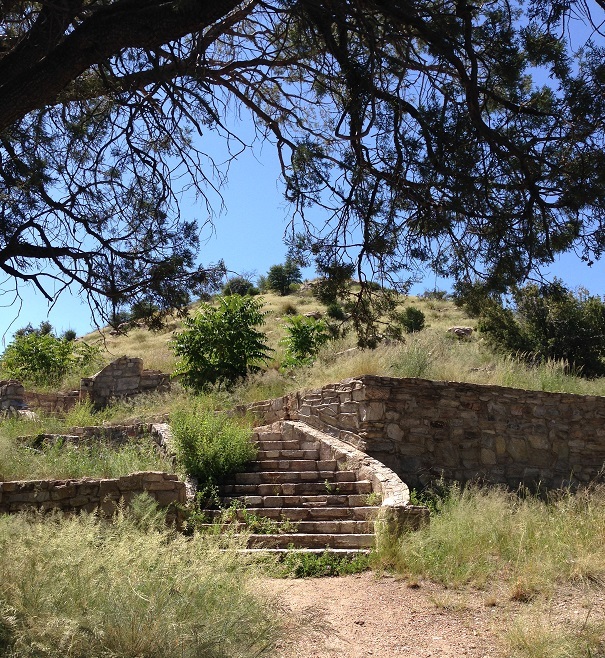 The Catalina Federal Honor Camp was a prison facility established in 1939, specifically to build the road to the top of Mount Lemmon. There was already a primitive road there, built by the Civilian Conservation Corps earlier in the century, but active and avid tourism necessitated something better. That’s where the camp prisoners came in. 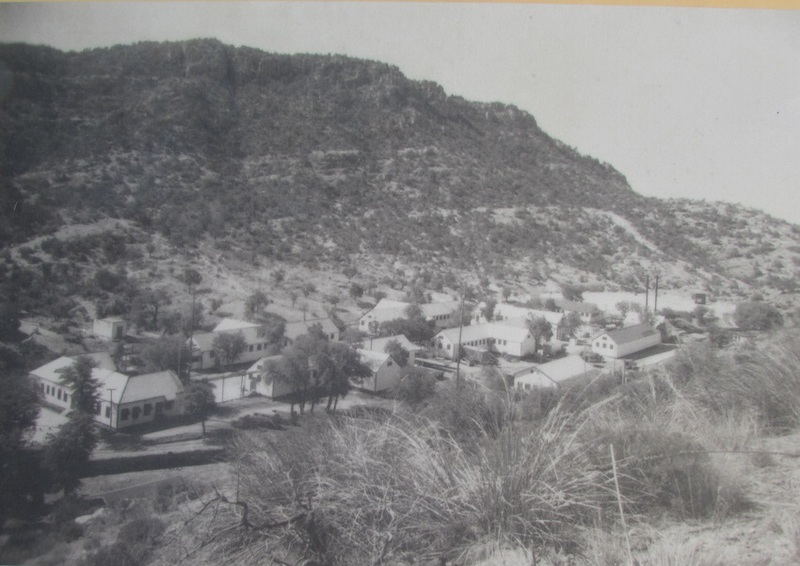 The camp had about fifty buildings, including barracks, administrative offices and staff housing, mess hall, workshops, powerhouse and classrooms. There was no fence or guard tower and security was not enforced. The prisoners worked with picks, shovels and wheelbarrows in the beginning. Later, bulldozers and jackhammers were added. Early on, the prison population consisted of tax and immigration law violators. Later, during World War II, the camp housed draft resistors and conscientious objectors. During that period, the prison population of about 200 was made up of mostly Hopi Indians, Jehovah Witnesses, Quakers, and Japanese Americans. One of Japanese American inmates was Gordon Hirabayashi, a University of Washington student and a Quaker. He was arrested for violating curfew and exclusion orders (a military order requiring all persons of Japanese descent to vacate the west coast and “voluntarily” go to relocation camps) and spent two years in a Spokane, Washington jail as his case worked its way to the Supreme Court. The court upheld his conviction and he served the remaining three months of his sentence at Catalina. In a “can this really be true” (it is) twist to his tale, he hitchhiked his way to the Tucson prison because the US government had no funds to pay his way from Washington to Arizona. It took him two weeks. When he got to Tucson, prison officials couldn’t find his papers and wouldn’t admit him. They suggested that he go to a movie while they looked, which he did. By the time the movie was over, they’d found his papers and he was processed into the prison. His case was reopened in the 1980s, when documents were found showing that the government had deliberately withheld information and misled the court. When his conviction was overturned in 1987, the government decided not to appeal and Hirabayashi became a symbol of the fight to protect the Constitutional rights of all Americans. The honor camp operated until 1951, when the highway was completed. It became a prison for juvenile offenders, then a reform school. It finally closed in 1973 and the buildings were destroyed (though foundations remain). Now, among the foundations and picnic tables, are information kiosks with panels telling the story of the camp and of the internment of Japanese American during WWII. Hirabayashi picked up his interrupted studies at the University of Washington after the war, got a PhD in sociology, and ended his career as chair of the sociology department at the University of Alberta. He was still alive in 1999, when the former prison camp became a camping and picnic area run by the US Forest Service, and was named after him. He and a few other Japanese American inmates were present at the dedication. He was a human rights activist in retirement and died of Alzheimer’s in 2012. The road that the prisoners built is a steep and windy (that’s a bendy, turny, long-I-wind, not a blowin’-in-the-wind wind) 30 miles through slices of mountain and several eco systems. Calling it “one of the most spectacular drives in the country,” the University of Arizona College of Science has produced an audio tour of the route. Gallery | This entry was posted in Arizona and tagged Catalina Federal Honor Camp, Gordon Hirabayashi, Japanese American internment, Mount Lemmon. Bookmark the permalink. He should have gone to see “The Count of Monte Cristo”! LOL. That would have been appropriate.